Download this case study to learn how Rumba improves business efficiency. The challenge was to speed up access to policies and enable real time insurance quotes for the sixth largest insurances group worldwide. This company has 60,000 employees with 30 million customers in 25 different countries. 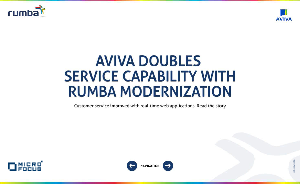 They have the ongoing pressure to improve service level to customers and Rumba helped them achieve that.